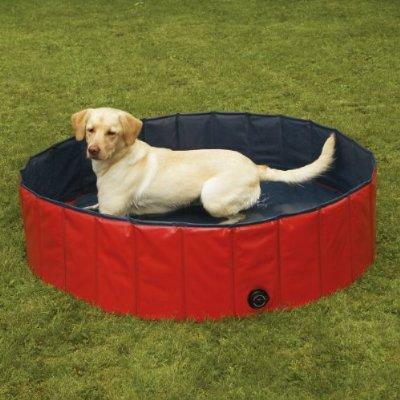 A PVC dog pool is sturdy and easy to store. Dog swimming pools may look just like a regular swimming pool, but there are a few features that make them special. See what to look for when you choose a pool for your pooch. There are several types of swimming pools made specifically for dogs. Typically, dog pools come in plastic or metal, but some people also install actual in-ground pools for their dogs. Why would someone want a pool for their dog? For exercise and fun; the same reasons that a person gets a pool for themselves. Most dogs love to swim and even compete in some cases. Other dogs are quite happy just having some water to lay in to cool off in the summer heat. This is what you will need to determine first when selecting a pool for your dog. What is your dog's activity level? Is your dog a breed that loves the water, like a Portuguese Water Dog, or does your dog prefer to lay around and just needs something to cool off? Once you have established your purpose, you can select the pool for your dog's needs. Now you're probably wondering, why not just buy a plastic kiddie pool? You can, but it will not be as durable. Plastic swimming pools for children are thinner and not nearly as sturdy as one specifically designed for canine use. So you can get one, but don't expect it to last as long. Plastic dog swimming pools are generally fabricated from the same type of material as truck bed liners. This means they are thick, strong and able to withstand a dog's toe nails or teeth. They will last a long time and are unlikely to be easily punctured or damaged. Some dog pools are made from super-strong PVC. They are nice if you need to be able to pack the pool away in the cooler months. The PVC pool is easily collapsible and can be rolled up and stored until summer. Often, plastic dog swimming pools are designed with a built-in ramp or sloping sides that make it easier for dogs to get in and out on their own. If you want an indestructible dog pool, metal may just fit the bill. If this is what you want, you can simply purchase a stock tank at a local feed or farm store or even on Amazon.com. Medium size breeds can swim around in a pool this size and even larger breeds can enjoy the cool water. Keep in mind, your dog will need to be able to get in and out easily. It is recommended that you install a ramp or stairs so your dog can get in and out on his own when he needs to. Always show your dog how and where to enter and exit the pool. Never leave your dog unattended around water. It's a good idea to provide your dog with a life jacket or vest to add buoyancy and guard against drowning if the dog accidentally falls in. Some dog owners are willing to go through the expense of installing an in-ground swimming pool for their dogs to swim and exercise. This is nice if your dog swims competitively or just really loves the water. However, it is pricey, and you will need to make a few adjustments for it to work properly. Dog hair can clog pool filters and pool chemicals are not good for your dog (or for you!). In this case, it is best to look into companies that offer chemical-free filtration systems. There are salt-water filters, ozone filters and even the European natural swimming pools that clean the water naturally just like a pond. You may think that your children and dogs can share the pool and play together, but usually this is not a good idea. Dogs don't know to wipe their feet before entering the pool. It is generally more sanitary to have a separate pool for your kids and for your dogs. They'll still have fun, and the people pool will stay nice and clean. Provide plenty of dog-friendly pool toys and everyone will have a great time. After all, it's just as fun to watch your dog play in the pool as it is for your dog to play. Be sure that all toys, as well as the pool itself, are kept clean to prevent any bacteria that could make your dog sick. After a day of fun in the pool, rinse your dog with clean water and dry him off well, being careful not to neglect his ears. With proper supervision and a well thought out play area, your dog will love those hot summer days. Dog pools vary in price from $20.00 to several hundred dollars depending on the size and manufacturer. However, your dog will get several times that in fun and exercise for many summers to come.